Anchored by a number of fantastic performances—and just as many squandered actors—Scott Cooper’s gangster saga BlackMass is by turns a compelling crime drama and a standard, by-the-book biopic. For all the positive elements, the picture is ultimately held back by the constraints of the form it takes. Following the exploits of real life Boston gangster James “Whitey” Bulger, Johnny Depp plays the role under layers of makeup and shrouded by ice blue contacts, but even with all of these accouterments, it’s easily his best performance in years. He seethes with menace, shifting from the amicable good humor that made him a kind of beloved Robin Hood figure in South Boston, to straight up terror that makes your blood run cold. One scene in particular stands out, where the topic of conversation is nothing more important than how to marinate a steak, but it winds up absolutely chilling. The thing about Bulger that set him apart from your standard gangsters, is that not only was his brother Billy (Benedict Cumberbatch) a Massachusetts state senator, which offered a level of protection, he was also confidential informant for the FBI, a status that he used and abused to his advantage every step of the way. His status useful to vanquish his enemies, and his relationship with FBI Agent John Connolly (a fantastic Joel Edgerton), a childhood friend gone cop, offered him a virtual get out of jail free card. 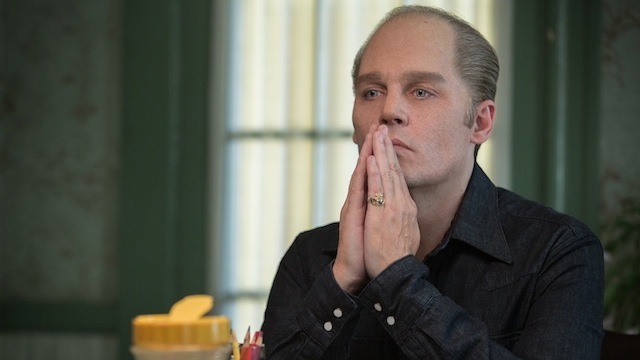 The biggest problem with Black Mass, however, is that you get exactly the story you expect. It tracks Bulger’s rise from small time hood to kingpin, and watches as it all crumbles. 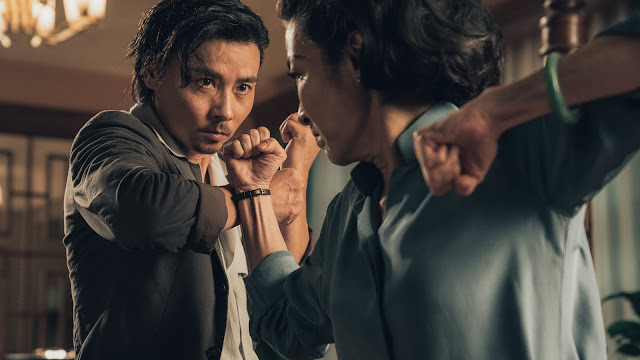 Every step of the way, what’s going to happen next is painfully obvious, and there is a predictable inevitability that makes the story play as stale and rote. As far as Bulger goes, as good as Depp is—this should serve to remind you how skilled an actor he can be when he doesn’t rely on silly props and affected accents—he can only do so much. It’s like watching a vampire tear apart the Boston underworld, but he’s also as one note as that sounds. The character has no arc, no development, and undergoes no change or evolution whatsoever. Edgerton, on the other hand, is the unsung hero of Black Mass. His Connolly is a Southie kid who grew up idolizing the Bulgers, something that never changed, even as he started playing cops and robbers for real. He’s willing to sacrifice everything—his career, his wife, his freedom—for his hero worship, and he is by far the most intriguing character to watch. 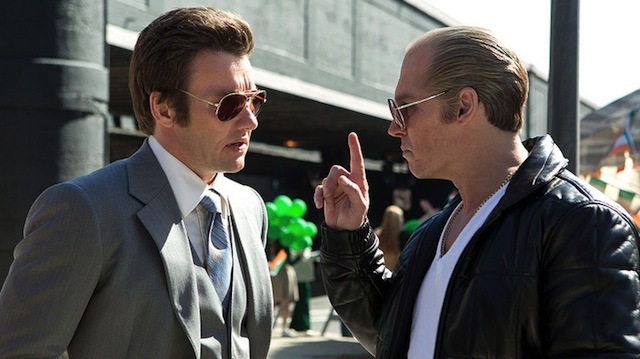 At times he threatens to take over the story, and Depp’s Bulger becomes almost a side player. In true biopic fashion, much of the rest of the cast is woefully underutilized. Spanning decades, characters show up, occupy a momentary place of importance, and are never seen again, like they’re disposable. Dakota Johnson plays the mother of Bulger’s son in a short, tragic arc that is supposed to be hugely definitive in his life, but it is given such short shrift that it is forgotten a few scenes later. Adam Scott plays an FBI agent who, though he and his mustache are always around, only has a handful of lines and is totally wasted. This list of fantastic actors who are under or unutilized could go on much longer, and includes Sienna Miller, who was cut from the film entirely, Kevin Bacon, Corey Stoll, and more. Cooper does have a strong feel for the initial 1970s setting, though as the picture moves forward from 1975 into the decade of excess, there is relatively little surface change. While a movie like Goodfellas whips you through year after year, era after era, you always get a sense of time and place, whereas in Black Mass—which is no Goodfellas, no matter how hard it tries—nothing ever changes, neither the setting nor the characters. Black Mass plays like a greatest hits collection of Bulger’s most heinous acts, amounts to little more than a string of events, and there is rarely any satisfying resolution to any of the various threads. For the most part, narrative strands simply picked up and discarded, and as if to drive home the point that there is no movement, the film ends with the ubiquitous title cards that give the audience a brief rundown of what happened to each individual. Structurally, Black Mass uses a framing device where Bulger’s former confidants and close friends—including Kevin Weeks (Jesse Plemons), Steve Flemmi (Rory Cochrane), and John Martorano (W. Earl Brown)—turn state’s witness. Bulger makes his stance on rats crystal clear—he cuts them up—despite the fact that he himself is an unapologetic rat. This gimmick is used sporadically, so much so that when it pops up later in the film, after it has been absent for a good long while, it’s jarring and causes the pace and momentum to sputter.